Large and functional when unfolded, the tent fits into a compact pouch for comfy storage and handling after use. Some users might find floor material thin. Easy to use, store, and transport, Pacific Breeze tent will be a great shelter for comfortable rest of 4 or even 5 people. 52" x 94.5" x 51.2"
Sand screws included in the box provide better stability of a canopy. You'll need to go outside to close/ open the windows. Need an awning to fit a really big company of friends? As large as it is, WildHorn Outfitters model also boasts an awning that makes it even more spacious. 54" x 90" x 90"
Large window is almost as big as doors, so you can use it as an alternative entrance. Sun protection handles only middle-wavelength rays. With Coleman DayTripper Beach Shade, you'll get an ideal shelter for two people to not only enjoy wonderful views but even take a nap to the sound of the ocean. 57" x 90" x 52.5"
Thanks to automatic frame system, the tent is assembled in mere seconds, so any user will handle its installation effortlessly. Chances are the tent won't withstand strong wind. Opt for Pacific Breeze Products large tent, and enjoy having a great time at the ocean with your near and dear. 47" x 87" x 49"
A beach tent set includes an ergonomic round bag with a shoulder strap for convenient tent storage and transportation. 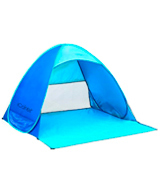 Moreover, the tent folded dimensions are small enough to easily carry it wherever you go. 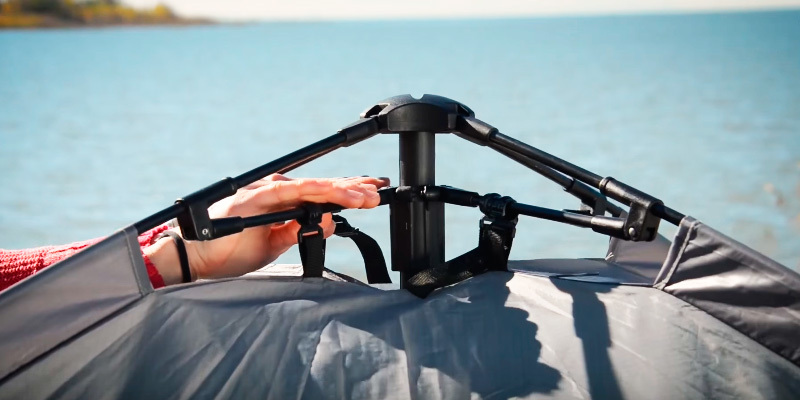 Suitable for a single person or for a couple, the iCorer pop-up tent is a perfect alternative to a more clumsy and less stable beach umbrella. At a truly affordable price, it will not only create a nice shade but also protect you from harmful UV rays. 43.5" x 65" x 59"
Looking for a spacious tent to spend a wonderful day with your near and dear somewhere at the ocean? Then, Pacific Breeze model is worth your attention. Being a three-wall unit with three big windows and a floor, it will become a comfy shelter for your company in all weathers. It has become possible thanks to the material of the tent (breathable polyester) that not only protects you from harmful sun rays but is also water resistant. Plus, you can cover the windows from the inside with special curtains to dim too bright a light or to shelter from the rain. However, note that this model isn’t equipped with a door and won’t protect you from annoying insects at nighttime, so it isn’t suitable for staying overnight. But don’t let this minor inconvenience spoil your impression of the Pacific Breeze tent since it can guarantee great rest for a company of 3-4 people from dawn to dusk. 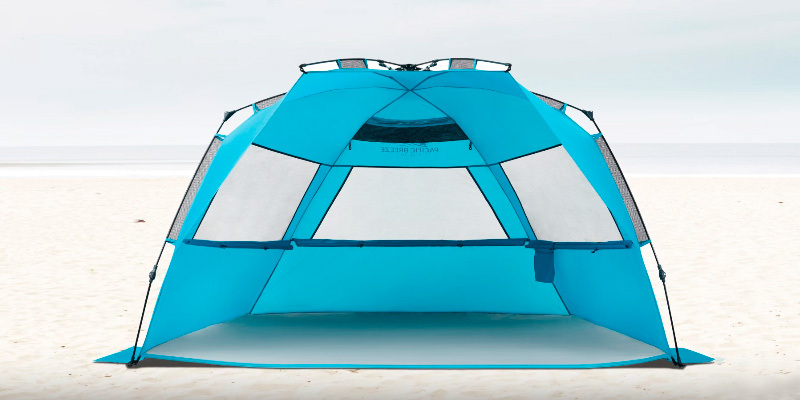 The first thing everyone supposes a beach tent can protect from is UV rays, and it's true. 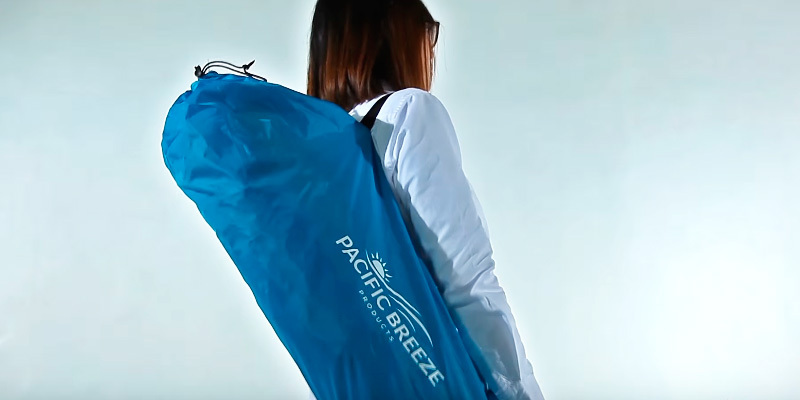 As for Pacific Breeze model, its material features UPF 50+ index that blocks almost all harmful rays, thus, makes your rest in the shelter totally safe. But that's not all. As it was already mentioned, this model is made from water-resistant polyester and can also be used when it's raining. Moreover, it's even possible to wait out a sandstorm if you close the windows. The only thing to keep in mind is that you won't be able to hide from a wind blowing on the entrance side, so if a storm starts before your eyes, it's better to move to a safer place. • Unpack the tent, put it on the ground, and spread out all the edges. 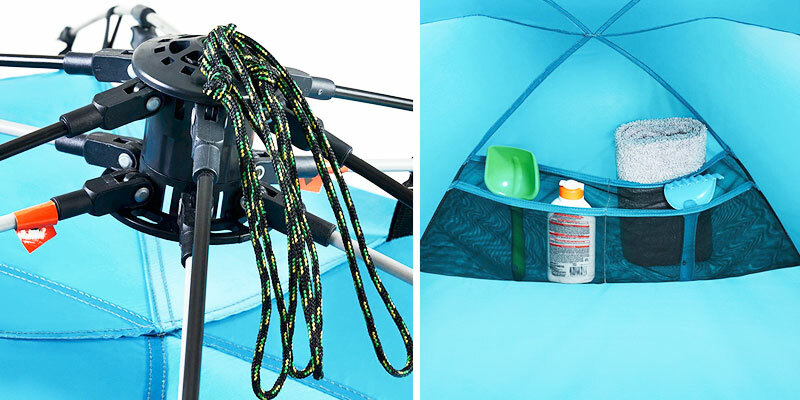 • Lock two front poles and pull the drawstrings - the frame will shape into the tent, and you'll hear a click. 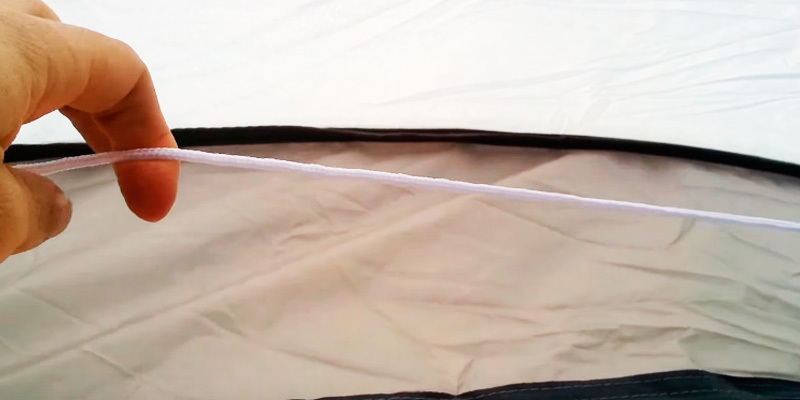 • Tie the drawstrings to prevent accidental closing of the tent. 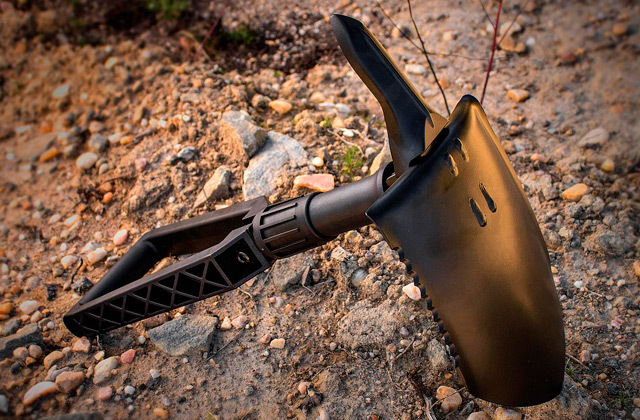 • Use stakes to anchor the unit in the sand/grass/ground. For better stability, you can fill sand pouches with sand or pebbles, and be sure the Pacific Breeze tent will withstand any weather conditions. Finally, take notice of a compact size of this model when folded (38" x 6") and a convenient carry bag that makes storage and handling easy as a breeze. If you're not sure you'll install a tent fast on the beach, try doing it beforehand - assemble and disassemble it several times at your backyard, and you'll soon be able to do it on your own in the twinkling of an eye. What makes a perfect tent for active rest? 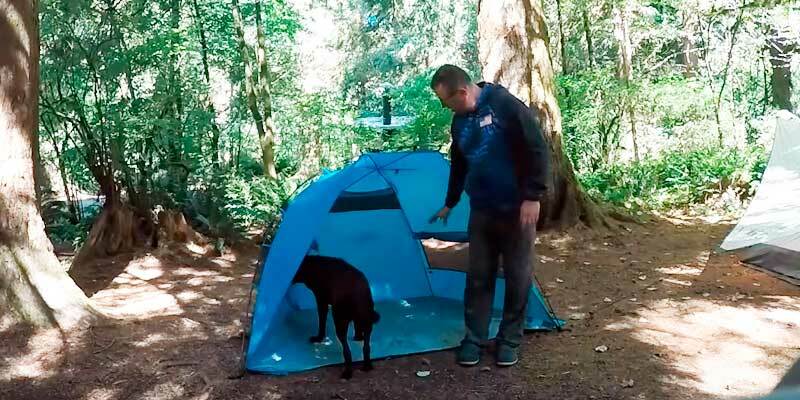 In our opinion, it's all about a spacious shelter with conveniences that can fit in a compact storage bag after use. 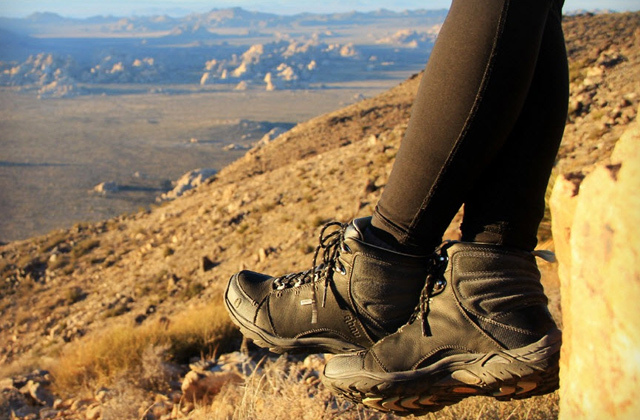 If you share our point of view, the WildHorn Outfitters will definitely interest you. Measuring 90" x 90" x 54", this model allows even tall people to feel comfortable inside, not to mention there is enough room for 4-5 people to stay overnight. 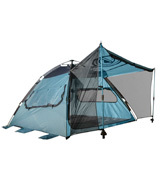 Yes, you haven’t misread it; this tent can be used even at night thanks to the windows and door you can close. 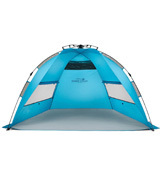 Thus, choosing the WildHorn Outfitters model, you’ll get a tent that is great to use at the beach as well as during any open-air events such as camping or musical festivals. Since the material of the tent greatly influences its functionality, we’d like to point out its major properties. Breathable polyester is made using a Rip Stop technology that, in addition to increased durability, provides effective water resistance. Besides, take notice of the Oxford fabric used for the floor. With 300D density, it can be placed on almost any surface without the risk of being torn or ripped. 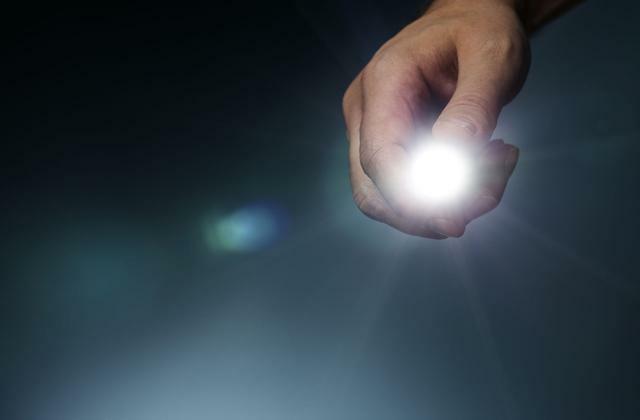 Don’t overlook sun protection features of the material, too. Boasting UPF 50+ rating, this sunshade creates perfect conditions for safe relaxation. A distinctive feature of the WildHorn Outfitters tent is definitely its door. Although it doesn’t seem special at first sight, it’s surprisingly functional indeed. The thing is that apart from serving as an entrance, the door can be turned into an awning for extra convenience and shade. To set it in this position, you only need to open the door, lift it up, and fix its edges with special poles included in the box. Don’t forget to insert them in sand screws in advance, for better stability. One more advantage of this tent is pouches placed outside that you can fill with sand to be sure the tent will stand firmly even if the wind rises. The last but not the least thing to consider is the simplicity of storage and handling. Due to a lightweight automatic fiberglass frame system, you will be able to take down the tent in mere seconds and transport it effortlessly. Pay attention to the window curtains located outside. 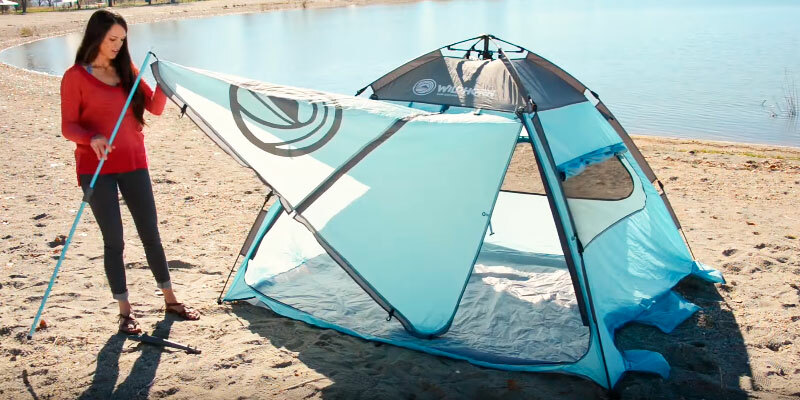 Although some users might find it inconvenient to leave the tent to close the windows, such design excludes the possibility of tiny chinks and, consequently, ensures better protection from the sand when it's windy outside. 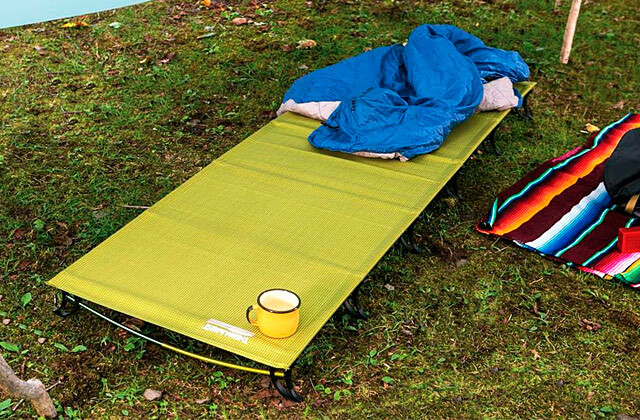 If you enjoy active rest, you’ve probably heard about Coleman products. 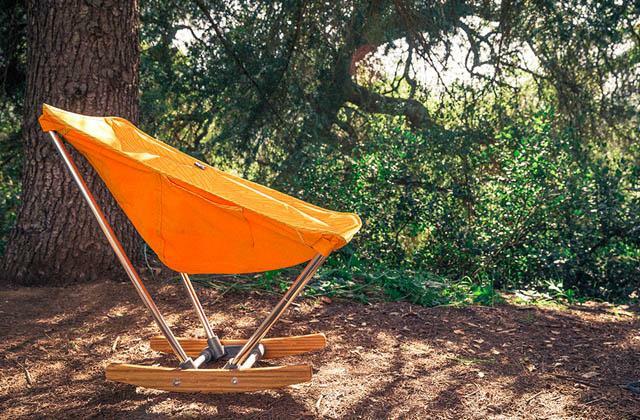 A reliable manufacturer of outdoor equipment, the company has been creating high-quality items for years, and the DayTripper Beach Shade is another one of those. As soon as you unpack this model, you’ll find a shade, several poles, and stakes inside, which means that unlike the models featuring automatic frame systems, this one is assembled manually. Although it might take you some time to get used to setting up the tent fast, after some practice, you’ll learn to do it effortlessly. All you need to do to assemble the tent is join the parts of the poles to get integral units, insert them into special mesh on the shade, place the tent where you like, and anchor it with stakes. Once you finish the installation, you’ll get a 90-inch wide and 57-inch high shelter ideal for two people. As it was already mentioned, effective sun protection is one of the most important parameters you want your beach awning to possess. Speaking of this feature, the Coleman DayTripper model is rated SPF 50+ that makes quite good protection. However, note that SPF can save you only from the rays of medium wavelength. In other words, long-wavelength rays can still affect you so it’s recommended not to stay on the beach for too long on hot days. 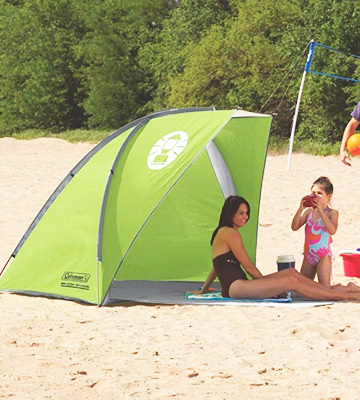 The Coleman beach shade boasts not only great functionality but usability too, and here are several factors that make it worthy of choice. The window is almost as large as the door, so you can use it as an entrance, too. The door and the window are fastened with reliable zippers which are more convenient to use than buttons and Velcro straps (often used in other tents). Moreover, zippers exclude the possibility of chinks and thus, provide better protection from sand and wind. 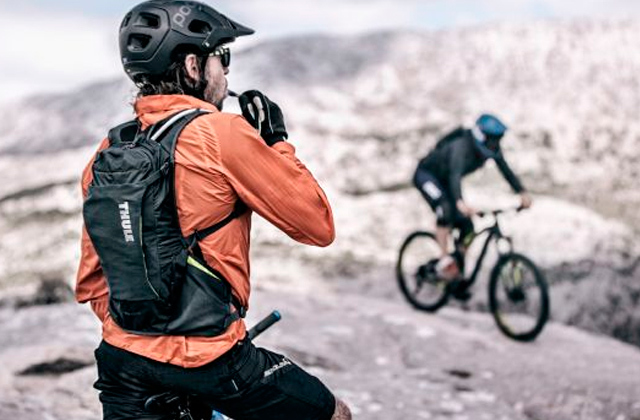 Mesh pockets inside allow you to store your personal items neatly. 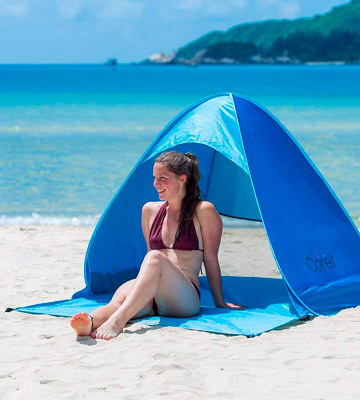 With the user in mind, the manufacturer has equipped the tent with a cloth line that allows you to air dry your swimsuit or other garments after an active day on the beach. We assume you don’t want your beach shelter to be heavy, bulky, and difficult to pitch. If we’re right, we recommend you to have a closer look at the Pacific Breeze Products Easy Up model. Just like most beach awnings represented on the market, this one features Easy Up Hub System, to put it simply, it boasts an automatic framing system, and all you need to do to install it is pull the ropes located in the middle of the system. As soon as you do it, the framework will open up like an umbrella, and you’ll only have to tie the ropes and use the stakes to stabilize the shelter. Now, you have enough space for a couple of people and even your dog. Since this model doesn’t have a door, it’ll be easy for your pet to get in and out the tent. 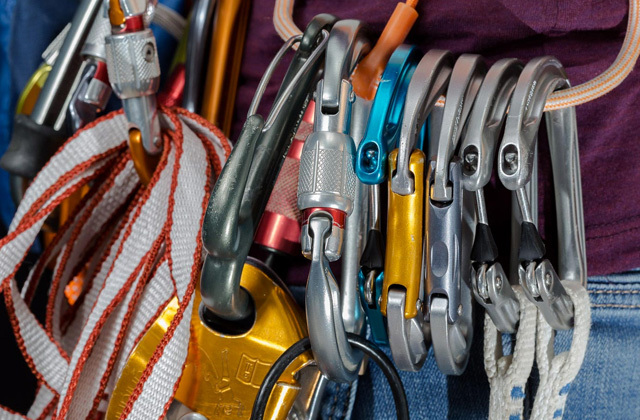 When it’s time to go home, disassembling the tent won’t become a problem, either - just remove the stakes, untie the drawstrings, and push the lower hub poles. 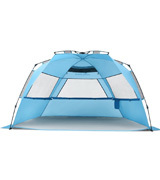 Choose the Pacific Breeze Products Easy Up tent, and let your rest be as joyful as possible. Speaking of the rest on the beach, you probably want it to be as safe as convenient, and this model can guarantee you the protection you need. First of all, take notice of UPF 50+ rating that will ensure comfy temperature inside the tent, and what is more important, will protect you from the harmful UV radiation. Then, you’ll still be able to enjoy your rest during windy weather thanks to window curtains that are closed easily with Velcro straps. The only thing to keep in mind is that using the tent won’t be really comfortable if it rains, however, the material still allows you to wait light precipitation out. So, if the forecast predicts sunny and cloudless weather, take your Pacific Breeze Products Easy Up tent and have a great time on the beach. 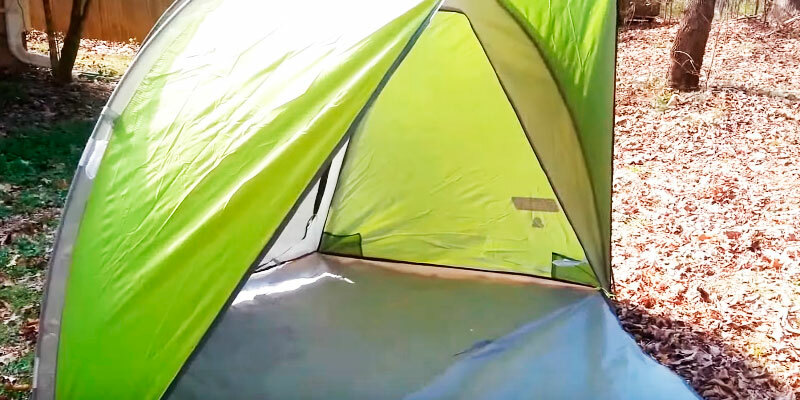 Taking into account the materials of the tent (breathable polyester for the shade and a fiberglass frame), it boasts surprisingly light weight of only 4.5 pounds that is even less than some beach umbrellas. 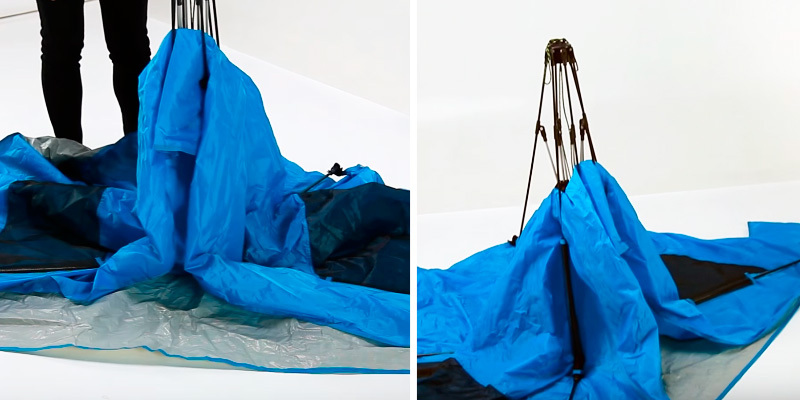 One more advantage of this model is two pouches included in the box – for the tent itself and for the stakes – that allow you to store your beach awning neatly after use. Take notice of a mesh pocket located high at the back wall. It will definitely come in handy if you want to have a family rest and prevent your little curious children from reaching any valuable or dangerous things. 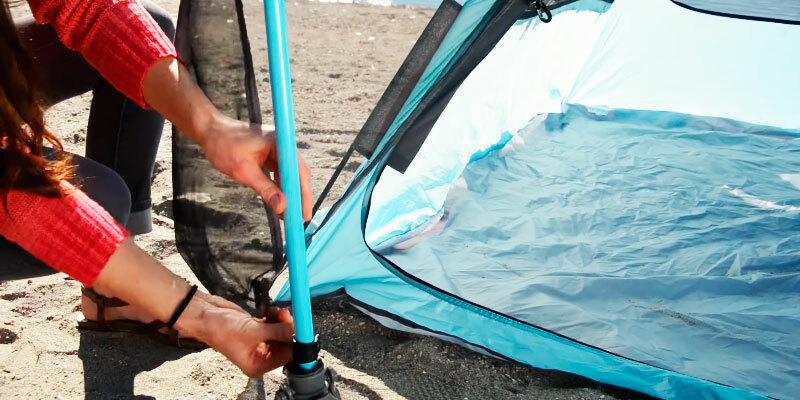 When we come to the beach, the last thing we want is to fiddle with tent assembly. And despite the fact that the vast majority of recent tents are made so that they can be easily set up, they still require minimum assembly and installation. With the iCorer beach tent, all is different. 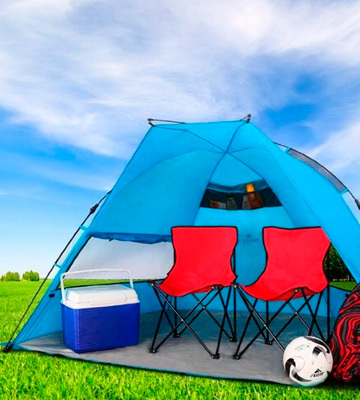 This is one of those tents that is easy not only to assemble in mere seconds but also to erect without a hassle. This model boasts an innovative automatic design and will simply pop up the moment you unpack it. No need to install poles and stretch the tent, no need to read any confusing instructions or perform any other time-taking actions. 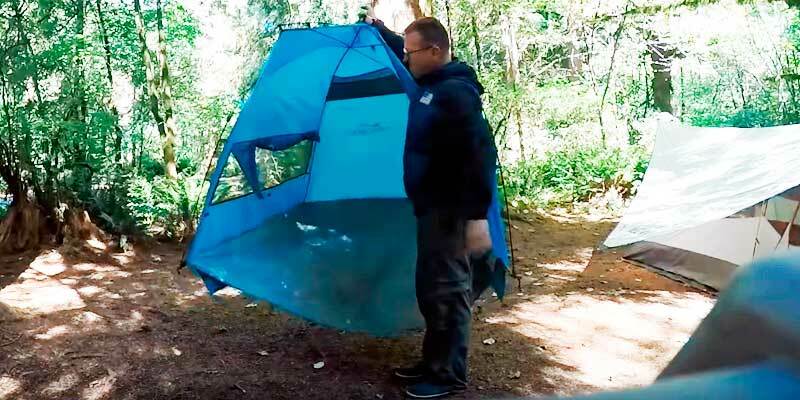 Just take the tent out of the bag and let it stand open. The only effort you'll need to apply is to sink the ground stakes into the earth and fill its sand pockets with some sand to prevent it from being blown down by the wind. 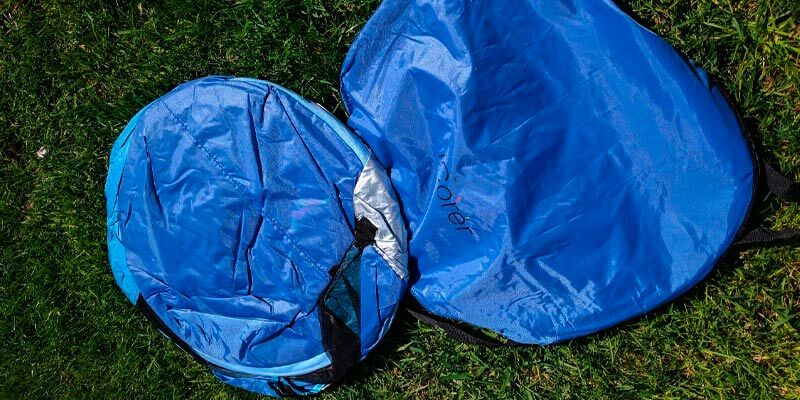 The iCorer pop-up tent is a perfect alternative to a clumsy and less stable beach umbrella and a rug. Another thing that you will certainly appreciate about this model is its fairly affordable price, which, however, in no way compromises the quality of product and its protective features. Metal beams that make up the frame are rugged and durable. They perfectly hold shape and won't bend or become deformed under strong wind. 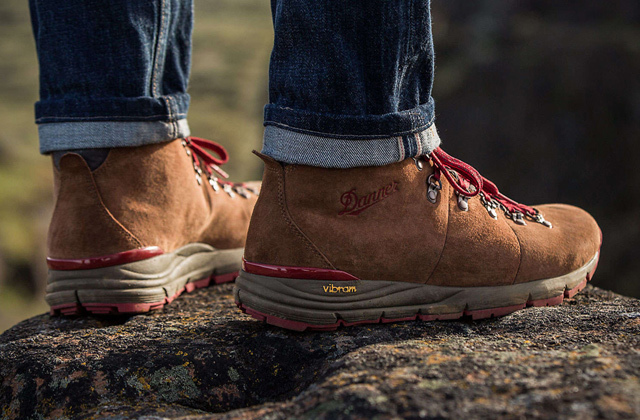 The nylon fabric is rip- and flame-resistant. It features a silver coated surface which perfectly reflects harmful UV rays and ensures secure UPF 50+ protection from overheating and sunburns, making a nice shaded shelter. Other basic convenience features include a large ventilation mesh window and an oversized fabric floor where you can stretch out in comfort away from the sand. So, even though the iCorer tent comes at a below par price, it doesn't lack in the comfort features you'd want a beach tent to have. Though most beach tents are relatively lightweight and can be easily carried in hands, it's portability where the iCore tent truly excels. 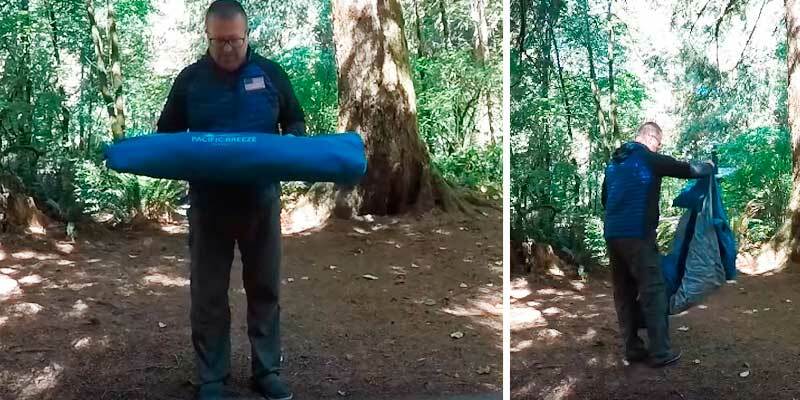 Not only is this tent easy to put together, it weighs just a bit more than 2 lbs so any person, regardless of his/her age, can handle it with ease. Moreover, when not in use, the tent can be easily folded and stowed away in a carry bag that comes included with the purchase. It won't require a lot of storage space nor will it weigh you down. An ideal choice for those who love to travel light. 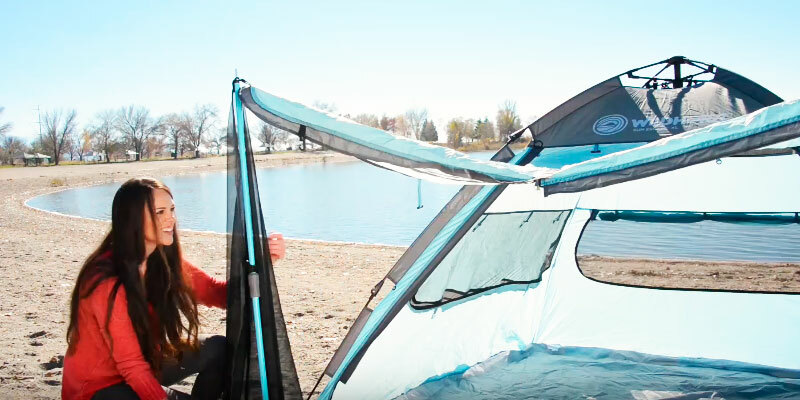 Summing up this review, we'd recommend the iCore beach tent to anyone who's looking for a simple yet high-quality tent for camping, tailgating, and other outings. Though not suitable for overnight trips, it will make a perfect all-day shade for all your picnics and weekend getaways. Spending a weekend at the beach with friends and family, swimming, playing volleyball, and sunbathing. Sounds great, right? But let us assume being under the sun during the day without any additional protection isn’t what you want. Here, a beach shelter comes in handy. 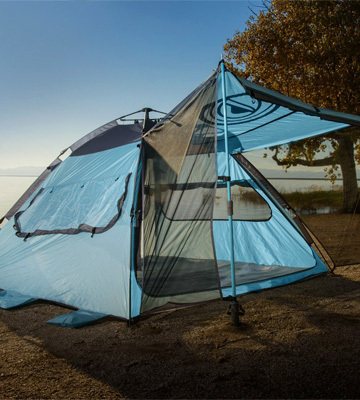 Unlike camping tents, beach ones are designed to provide you with more comfortable rest at the ocean mainly at daytime, so they are much lighter. Plus, the material of these sunshades is quite thin in order not to overheat and dense enough to protect you from sun rays, the wind, and sand. Modern tents are represented in the variety of models, so you’ll definitely find the one you need. 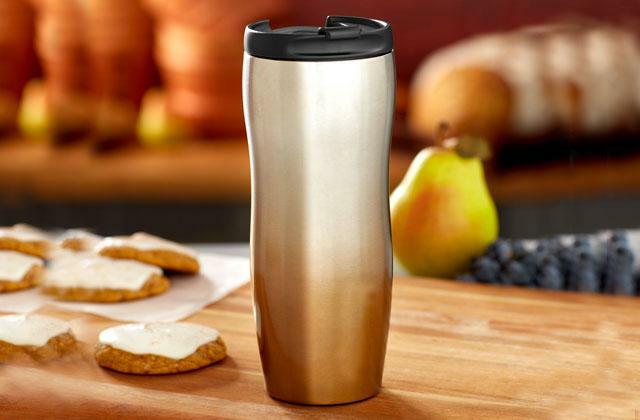 If you want to enjoy your favorite refreshing drinks at the ocean, take a travel mug with you. And one of the all-in-one knives will be of great use everywhere, be it a beach or a picnic. 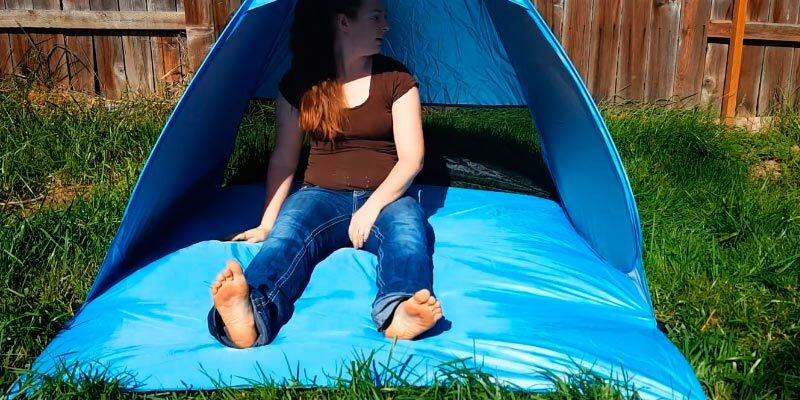 Considering a tent’s design is of the utmost importance. 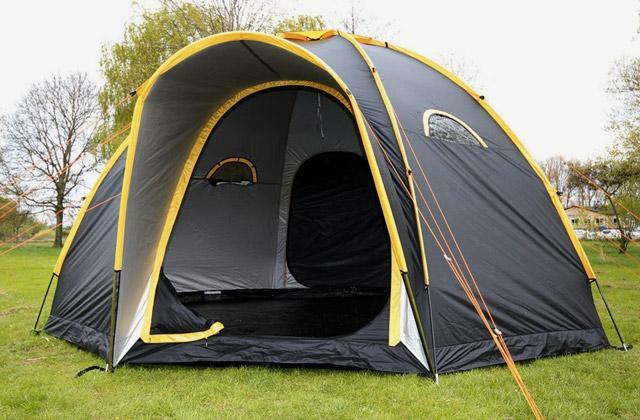 First of all, pay attention to its size and height since if a tent is spacious but not high enough, you won’t feel comfortable inside. Take notice of doors and windows too. Some models feature zippered doors that not only ensure additional privacy but can also be spread out to cover a larger area. As for windows, they allow you to enjoy ocean breeze when open or ensure better shelter from wind and sand when closed. Finally, an awning is a great addition as it produces more shade. The next thing to take into account is sun protection that can be measured in SPF (sun protection factor) or UPF (ultraviolet protection factor). The former is aimed at protecting you from UVB rays only and allows you to stay under the sun without the risk of being burnt. For example, a tent of SPF 15 standard means you can stay in the sun 15 times longer. As for UPF, it handles both UVB and UVA rays sun by blocking up to 98% of their quantity, thus, can protect your skin from harmful influence. Usability of a tent shouldn’t be underestimated too. First of all, consider the simplicity of installation; we bet you want this process to be as fast and effortless as possible. 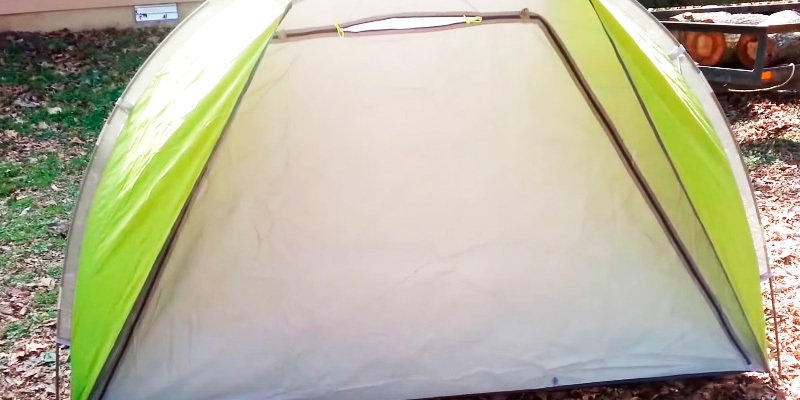 As a rule, most tents have automatic frame systems so setting them up is a matter of minutes. However, there are some models where you need to assemble a frame on your own. Take notice of special pouches that should be filled with sand or pebbles to provide better stability of your shelter in windy weather. By the way, you can also find sewn in pockets inside a tent that can be used for safe personal items storage. 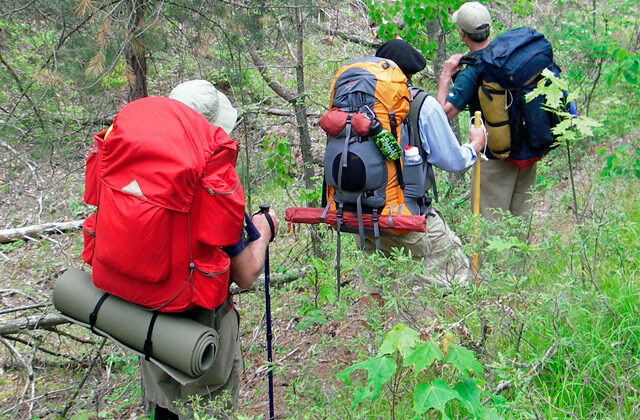 Lastly, keep in mind that the tent’s weight and a carry bag greatly influence the convenience of its transportation. Q: I can’t decide between a beach tent and an umbrella. Which one is better? A: If you are seeking for better protection from the sun even on dog days, it’s better to choose tents over umbrellas. Umbrellas provide proper shelter until sun repositioning starts while tents can protect you during the whole day since they cover a bigger area. Consider usability features too. 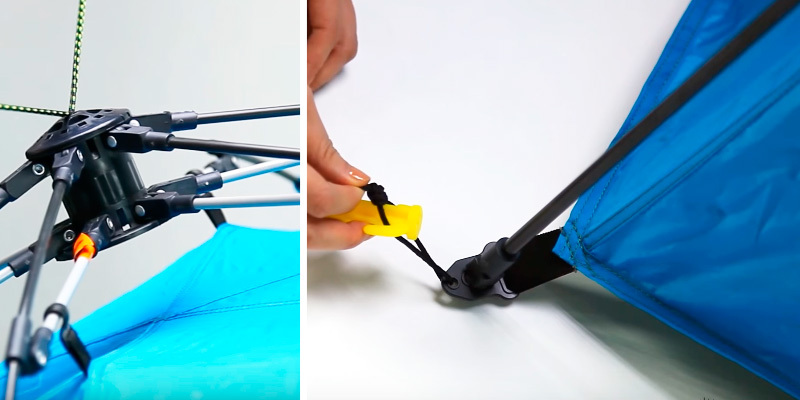 It’s quite inconvenient to carry an umbrella with you due to a long center pole (unless you use a car, of course) while modern tents are folded compactly and are sold with special storage bags. Q: How do I maintain my beach sunshade? 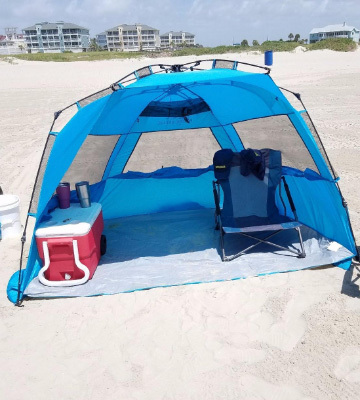 A: More often than not, all you need to do to maintain proper condition of your beach sunshade is simply shake out the sand after every use and put the tent neatly into a storage pouch. However, if you’ve managed to leave a stain on your tent, rinse it well with running water (or hose it down) and let it air dry. If need be, use a soft detergent. Q: Can I use a beach tent for camping or hiking in the mountains? A: The design of such tents makes it possible to pitch them on a terrain different from sand. 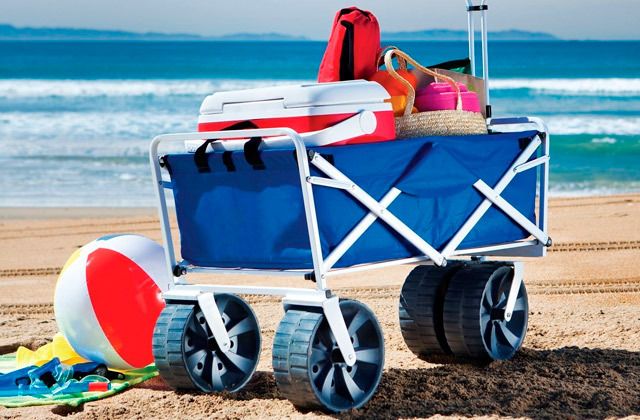 But keep in mind that beach models aren’t as durable as camping ones and aren’t usually suitable for staying overnight. Yet, if you want, you can take such tent on a picnic or one-day trip on condition of good weather. Q: Are there any restrictions on using a tent on the beach? A: It might be surprising but yes, there are some rules that should be followed. They vary from state to state and usually concern tent size, its location, the time your tent can stay on the beach, etc. 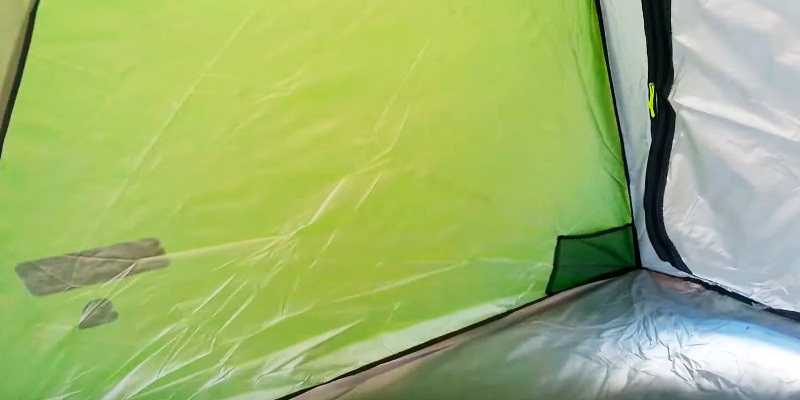 So before taking a tent with you, make sure you don’t break local laws. Q: Is it difficult to set up a tent? Do I need special skills to do it on my own? How long does installation process take? A: Setting a tent doesn’t require you to possess special skills. To install it properly, you only need to take steps specified in the instructions. Moreover, such tents are assembled easily, so even one person can handle this task. As for the time needed for installation, it depends on the tent’s size and design but doesn’t usually take more than 10 minutes. Q: Can I use camping chairs inside my tent? A: It’s possible if the tent height is enough. Plus, when considering using chairs inside, make sure their legs don’t have sharp edges that can damage the tent’s floor. 1. 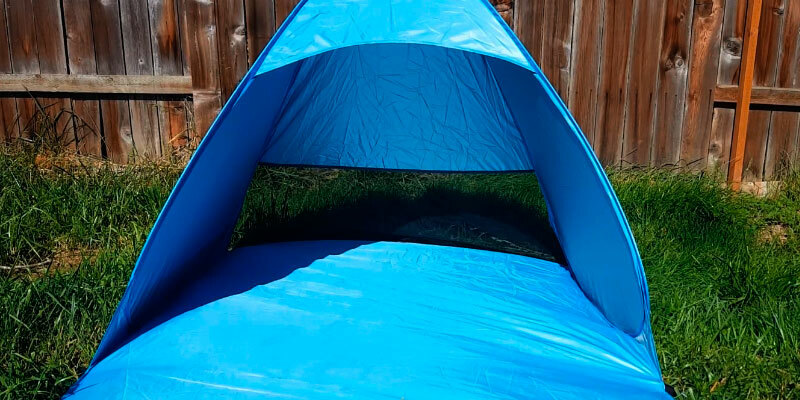 Beach Tent Buying Guide, eBay. January 20, 2016. 2. Make Some Shade with a Beach Tent, Lowe's. 3. Tent, Wikipedia. March 25, 2017. 4. How to Protect Yourself from the Sun, wikiHow. 5. 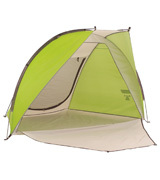 Rebecca Ciaramidaro Tent Buying Guide, Choice. March 2, 2017. 6. Tent Buying Guide, GOoutdoors. 7. 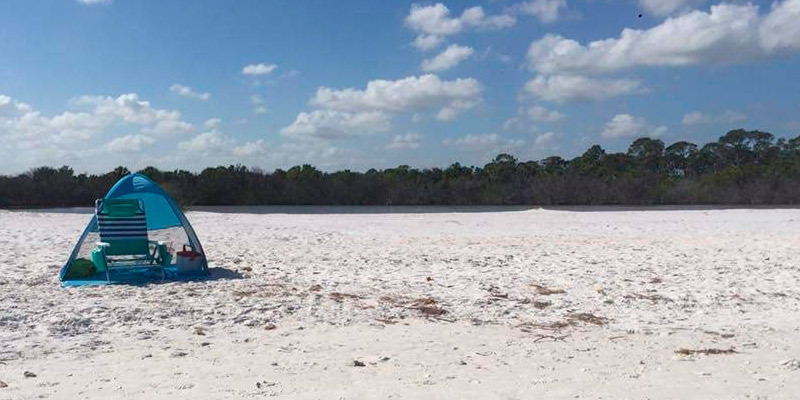 5 Tips for Assembling Beach Tents, eBay. March 10, 2016. 8. Protecting Your Skin From the Sun, WebMD.